Eight years following the events of The Dark Knight, Bruce Wayne is hobbled, disheartened and reclusive in his opulent manor. The streets of Gotham are clean thanks to Commissioner Gordon and the Dent Act (itself a piece of corrupt subterfuge) but there’s an economic crisis brewing. A cat burglar (Anne Hathaway, who brings a welcome slinky theatricality to her pivotal role) absconds with Bruce’s mother’s pearls. But he’s got even more lady problems with Miranda Tate (Nolan muse Marion Cotillard) who looks to take a controlling interest in the crumbling Wayne Enterprises. Meanwhile, a master terrorist named Bane (an unrecognizable Tom Hardy) orchestrates a daring mid-flight kidnapping of a nuclear physicist. These events set the wheels in motion, and from there it’s full tilt towards an explosive climax where all parties mentioned play an integral part that isn’t always made clear until that key turn of the screw. Christopher Nolan, like all great modern directors, has a variety of influences, but he might be the only director who constantly tells us what he wants to do in the future. The opening kidnap sequence is a masterpiece of Bondian-infused spectacle, making this the second film in a row (following Inception) where Nolan reminds us of his childhood dream to direct a James Bond film. Then just moments later, there are some off-handed remarks describing Bruce Wayne as a Howard Hughes-like lunatic where Nolan reminds us of his long put-off pet project involving the infamous billionaire. These references (which include his almost constant nods to Hitchcock and Fritz Lang), along with Nolan’s refusal to succumb to the genre conventions (at least not completely) and his unique psychological spin on character development are what make his blockbusters far more complex and enjoyable than anything else out there. A kiss is never just a kiss in a Nolan film. Oh, hey – nice lamp! Another refreshing Nolan trait is his desire to always up the ante from a both a technical and holistic standpoint. Eventually this is going to have to reach some kind of ceiling, but it hasn’t yet. Unlike James Cameron (who is obsessed with improving technology to the point of sacrificing story and character), Nolan never loses sight of his plots and motives. From a holistic standpoint, the set designs and special effects are more stunning than ever. They look so detailed, complete, real and expansive in the HD widescreen of IMAX, it’s hard to imagine this film ever looking dated. Meanwhile, his entourage, including cinematographer Wally Pfister and composer Hans Zimmer, yet again improve upon their already celebrated skills to deliver shots and pulse-pounding notes that will take your breath away. Zimmer’s score is so definitive, it alone raises the epic hand-to-hand combat between Batman and Bane to a level where it would be easy to classify it as one of the greatest fight scenes ever put on film. Yes – there are plot holes and leaps of logic that could span and fill all of Gotham harbor. A certain suspension of disbelief is a prerequisite of a comic book film. The leaps of logic are familiar to anyone who has sat through a Nolan film. But these will only bother those who refuse to go along for the ride. Fans of the series and fans of Nolan already know this and accept this and will overlook it because we want to. We want to have faith in Nolan. We want him to tell the story his way. We pay him to do it. It’s our tacit agreement with him as an artist. And we forgive him when he gets a little bit carried away with the logic. Nolan has always demanded of us to be a willing audience. We are his accomplices. And we gladly prod him along and inspire him to up his game every single time he lures us into a darkened theater. The beauty of a Nolan production (in this case, a fantastically cohesive trilogy) is that everything always comes full circle. The motifs are strung throughout – witness Bane’s terrorist act that invokes a French-style peasant revolution in Gotham by way of Al Qaeda if they were run by the WWF – Dickens would be proud. He continues to hold up a mirror to our post 9-11 world of terrorism, Arab Springs and Occupy Wall Street movements. There’s not a character arc or plot strand from this film or the first two that he doesn’t bring to some kind of conclusion here – spare for the glaringly obvious one of “What happened to the Joker?” If one insists on complaining, the ending is almost too tidy in its ambitions – Nolan seems to want to please everyone. And damn it, he just about pulls it off. Batman Begins was a near great film thanks to the novel way in which Nolan approached stale, generic material. The Dark Knight was a near great film thanks to the way a singular performance (Heath Ledger’s Joker) lifted a comic book movie to the level of a great crime saga. 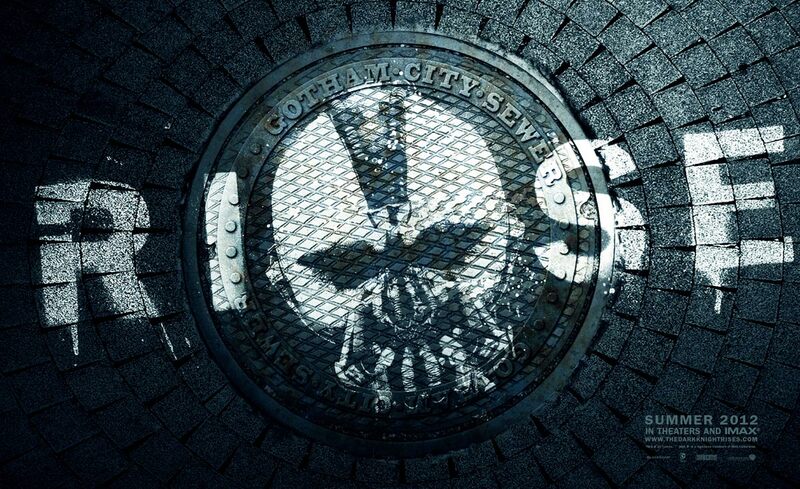 The Dark Knight Rises is a near great film because of its keen sense of bringing everything full circle despite all of the baggage it comes with and the lofty expectations put upon it. In the end, Nolan reminds us of his British roots, and much like Michael Caine raises his glass of sherry at the cafe, I raise my glass to Nolan and all involved for a job well done. Sometimes near great will do just fine. Lest we not forget, much like Dickens’ characters, we are too often orphaned by Hollywood and become inhabitants of two cities – one where we enjoy a Nolan summer blockbuster – and one where we suffer through the stifling mediocrity of everything else. Rejoice…or revolt (with your pocket books), citizens. The silver screen is ours. This entry was posted in Movie Reviews, Movies, Pop Culture and tagged A Tale of Two Cities, Anne Hathaway, Bane, Batman, Bruce Wayne, Charles Dickens, Christian Bale, Christopher Nolan, DC Comics, Economics, Gary Oldman, Gotham, Hans Zimmer, Joseph Gordon-Levitt, Marion Cotillard, Michael Caine, Orphans, Selina Kyle, Terrorism, The Dark Knight Rises, Tom Hardy, Trilogies, Wally Pfister. Thanks, Forrest – what was your professional opinion of the film? Oh man, Dave, this movie was relentless. The quickest, most intense 2 hours and 45 minutes I’ve ever spent in the theater in a long time. Yes, there are logic holes and other gaffes, but Nolan knew exactly how to steer the movie past them. The entire cast was at the top of their game, I felt. Hathaway was perfectly cast, and I actually felt the proverbial “lump in the throat” at the end thanks to Michael Caine. Can’t wait to see what Nolan does next. He’s really proven himself as a top-notch filmmaker. Chris – I agree – I didn’t think of the run-time for one second! I was totally immersed, as I almost always am with a Nolan film. I was worried the run-time would be a problem for me but it wasn’t. I was also most impressed by Hathaway who can be hit or miss depending on the role. She was perfectly cast here. I’ve never read the Dickens tale either, but it’s on my big fat list of stuff I should’ve read already! I think I’m going to go on a Dickens spree soon – it’s long over due. Nice spin there David! But somehow, I sense the Nolan fan-boy in you holding back some harsh criticism on this movie 🙂 Correct me if I am wrong. I didn’t enjoy this one as much as the previous installment but it sure did give me the creeps, specially in wake of what happened at Denver. The film, for me, just about made it. But the harsh reality of the real life we live in enhanced the experience for me. Watch out for my review (more a meditation on the world we live in) shortly. Prakash – there was so much good stuff in the film, it seems trivial to nitpick (like how the heck did Bruce Wayne get back to Gotham after the prison escape?). Bottom line, I was entertained as heck for 2hrs and 45mins. Nolan isn’t a Kubrick or Scorsese or PT Anderson who sets out to make a perfect film or grand artistic statement. Nolan sets out to entertain us while providing more depth and complexity than is commonly found in pieces of pure entertainment. If you were to talk about him in literary terms…he would be very much like a Dickens or a Graham Greene – a guy who bridges the gap between literary fiction and genre fiction (though Dickens basically created his own genre). I look forward to your write-up! And that’s the reason I too love his movies. I guess his Inception raised the bar so high, I just was expecting something different altogether. Again, that’s just me. The audiences are loving it every bit. The reaction in the theater I watched it at was like watching a Bollywood movie: hoots, whistles, screams, applause and what not. And believe me, I rarely see that kind of a reaction for a Hollywood movie in India. I’m glad to hear about the enthusiastic reaction in India! Oh! And thanks for pointing out the orphan allusion/metaphor in the movie. I think I missed that point. Maybe, I’ll go catch it again and like it better. Time will tell. I have a feeling this will hold up pretty well because of all the allusions. But we shall see. I would add Batman as a Christ figure through his suffering and trying to cure all that ails Gotham. Bane and the theme of false Gods. Comes through with imagery too with the statue of Batman towards the end of the film. Dianne – those are some astute observations – as always! Long-time no talk as I have been MIA from the blogosphere for a while. I still occasionally have been lurking around your blog and figured now was as good a time as any to finally drop in. Your assessment of this film and the trilogy as a whole seems to mirror my own. Sure, there are plenty of holes or flaws that are easy and popular to point out. But if you let yourself get drawn into the dark, noirish Gotham that Nolan has created, it is a wild, entertaining, and ultimately satisfying journey. Each of the three films contain what I consider to be Nolan’s one key flaw as a director – or at least a tendency that he has to (or at least needs) to try and resist. I am in no way comparing Nolan to Michael Bay, but it is what I see as a bit of a “Bay-sian” urge to try and stretch out action sequences well past the point where they have reached their highest point of tension. The “well, let’s just have one more thing go wrong” and extend it even further. Nolan’s worst use of this was in Inception, and it is not as much on display in the trilogy, but it is still there a bit. It’s my only nit-pick. I revisited both of the first two films over the weekend, found them to be even better than I remembered, and finally caught TDKR last night and was completely drawn into it. It’s pretty much as good as blockbusters get. Dave – it’s great to have you back on the blogosphere! Thanks for the kind words and great comment. It’s interesting what you say about the action sequences. The Michael Bay comparison makes me cringe – but I get what you’re getting at – but at least Nolan holds the action in frame (even if it drags on forever) whereas I don’t believe Bay has successfully mastered the very difficult cinematic concept of keeping what you are filming in front of the camera. I’ve never felt like ralphing during a Nolan action sequence either, so that’s a plus. This is a towering, impressive essay, and one I can certainly agree with in large measure David. I agree that everything comes full circle and the motifs are properly connected in this visually arresting superhero epic with (finally) the right focus on Batman and some splendid performances by Caine and Hathaway. The last 40 minutes in particular were stunning. I’d rate this film second behind THE DARK KNIGHT in the trilogy myself. Thanks, Sam – I kinda feel the same about all three films though admittedly the second probably ekes out ahead of the other two for reasons all well known to the masses. The best part about the series is how tonally and narratively cohesive it is (despite the changing look of Gotham and some cast changes).